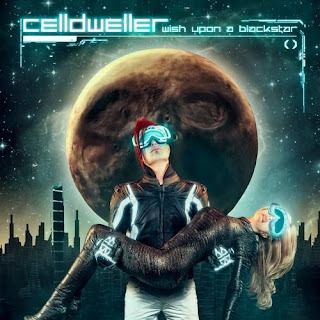 Also from the 'somehow we missed this' vat, Celldweller's new album is upon us. We have mentioned this band here several times because many consider them to be the gold standard of electronic/synth rock. When you think Celldweller, think Blue Stahli. Think I Will Never be the Same. All of these artists share one thing in common--a propensity for thick, chunky, and groovy electronic rock tunes. When listening to this album I almost thought it was too good for its own...good. Both undeniably glitchy and impossibly catchy, this album creates a fine balance between melancholic wandering, danceable grooves and fun electronic beats. Not unlike the aforementioned bands, Celldweller uses distorted buzzing guitars in tandem with Reznor-esque singing with sparse screams. The one complaint I have with "Wish Upon a Blackstar" is that I feel it overstays its welcome by about 20 minutes. The relentlessly catchy and singable tunes need a breather occasionally, but this album clocks in with a heft 16 tracks. Some bands try so hard to create catchy tunes that they lose sight of the real purpose behind the music. This is a good album, but not in the same atmosphere as the latest I Will Never be the Same disc. This music is fun to listen to but much like an amusement park, one can only take so much of it before they are ready for something else. If you are in the mood for some poppy, dancy, groovy electronic synth rock music, then this album should fill the niche. Don't take this disc too seriously or it will wear on you. Just have fun with it. Enjoy the full album stream via Celldweller's soundcloud page below. As always, thanks for reading!